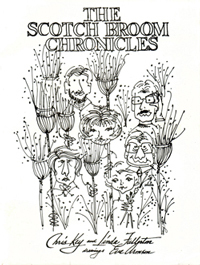 Chris Key and Linda Fullerton wrote The Scotch Broom Chronicles (1985) - a humorous and illustrated take on island life. Entries include an 'Official Bainbridge Island Excuse List' and 'When you know you've lived on Bainbridge Island for too long'. The later list includes believing that zucchini is edible and thinking that the ferry docked every time someone blows his nose. A copy of The Scotch Broom Chronicles can be found in the local authors collection of the Bainbridge Public Library.